At the end of June Suggsy was brought in by her owners after falling ill after a walk. On the day of the walk, Suggsy was her usual happy, bouncy self and was enjoying running around when she suddenly appeared out of some bushes and vomited a large amount of a white substance. The following day it was apparent that Suggsy was not feeling very well so her owner brought her in to see vet Melanie. Her abdomen was very sore and she was very lethargic. Suggsy was admitted to the hospital for blood tests and supportive treatment which involved intravenous fluid therapy and injections that provided pain relief, a medicine to stop her feeling nauseous and an antibiotic. We ran the blood test in our in-house laboratory and the results were quickly available. Suggsy was suffering from acute kidney failure and she was gravely ill. It was important that she remained on intravenous fluids. The fluids ensured that Suggsy stayed well hydrated and they helped to dilute and flush out the excess toxins in her blood. 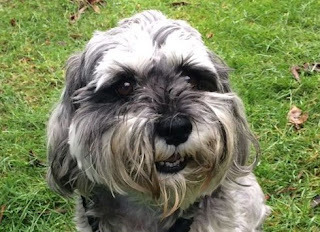 Following the history given by Suggsy’s owner of how quickly she’d become ill and analysing the results of her examination, blood test, and abdominal ultrasound, Melanie concluded that Suggsy had quite possibly eaten something toxic. Over the next few days, Suggsy remained on supportive treatment. Our aim was to keep Suggsy as comfortable as possible and to continue to support her kidneys to give them a chance to recover. She was unable to stand so we needed to frequently change her resting position to reduce the risk of bed sores and pneumonia. After four days in the hospital we were encouraged to see a little improvement with Suggsy. She was showing more interest in her surroundings and even managed a little potter around the garden. Vet Cathy repeated some blood tests and her kidney measurements were improving. Further test results showed that Suggsy’s liver was not functioning properly. An ultrasound scan revealed that her liver was enlarged and swollen (hepatomegaly). The liver is a highly regenerative organ and in some cases a dog can recover from acute liver disease, so supportive treatment for both her liver and kidneys was continued. After 8 days in the hospital we were delighted when Suggsy began to eat some chicken and we could see a little sparkle in her eyes. By day 12 of her hospital stay, Suggsy was well enough to go home. Her owners have been bringing her in regularly for check ups so that the vets can assess her response to the treatment. Suggsy's liver is less swollen and her abdomen is more comfortable. Her appetite is slowly improving and her blood test results have shown an improvement in both her liver and kidney function.